I was reading an article on Moviefone about Movie monsters and love. The article looks at The Beast, King Kong, The Phantom, The Wolf Man, Teen Wolf, Gill-Man, Swamp Thing, Shrek, Bram Stoker’s Dracula, the Twilight boys and of course Disney’s Quasimodo. The write-up on Quasimodo and Esmeralda is basically the same old complaints with zero on incite to what the movie was trying to do. 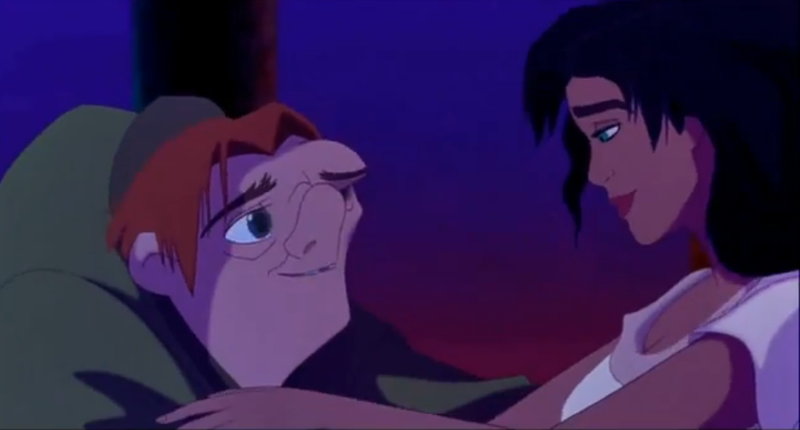 The articles implies that Esmeralda is not in love with Quasimodo because he is ugly. 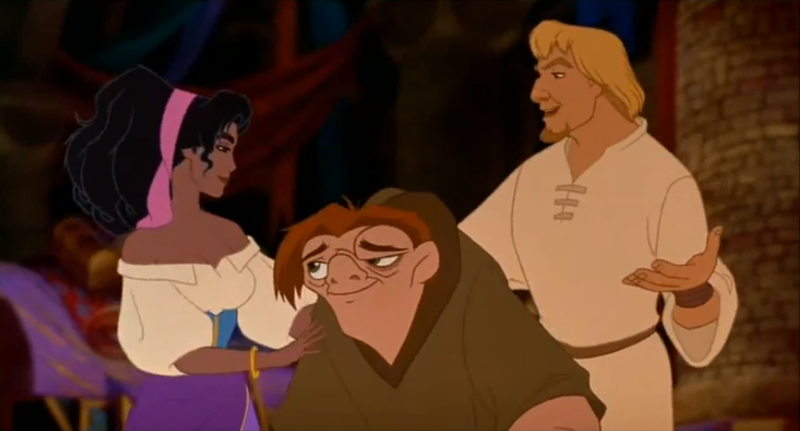 I think that if Quasimodo was in fact good-looking or normal looking but had the same personally she still would not be in love him. She treats him like a child. She supports, him and wants him to succeed but while she like his kindness she doesn’t find it a turn on. Esmeralda seems to like confidence, dry wit and kindness. Quasi doesn’t have have the first two traits at all. The Article also calls Phoebus vain? What? How do you figure? Is it because he say’s his name mean “Sun God?” Because he sounded more self-mocking than egoistical. 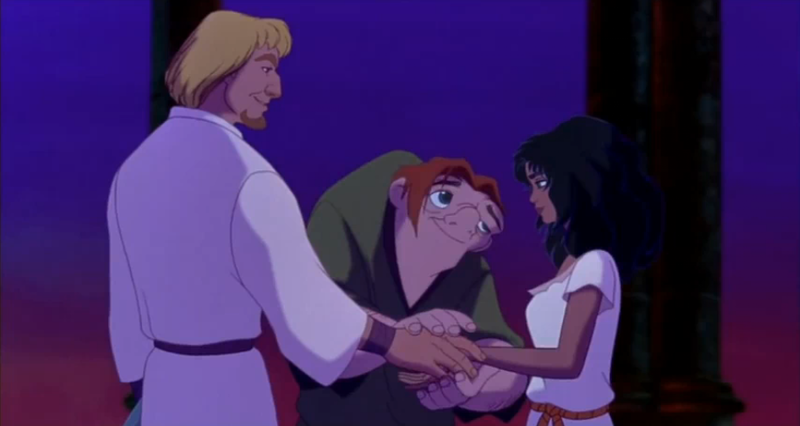 But I find it amazing that the general public are so quick to bring up the fact that Esmeralda does not fall in love with Quasimodo. The movie does several things which I have mentioned over and over (read here) to get the audience on the couple’s side. They share their first scene together, the have the snarky Disney couple trope, they have the same personality, they treat each like people not angels or devils, their animals have the same coloration. What else can this movie do? 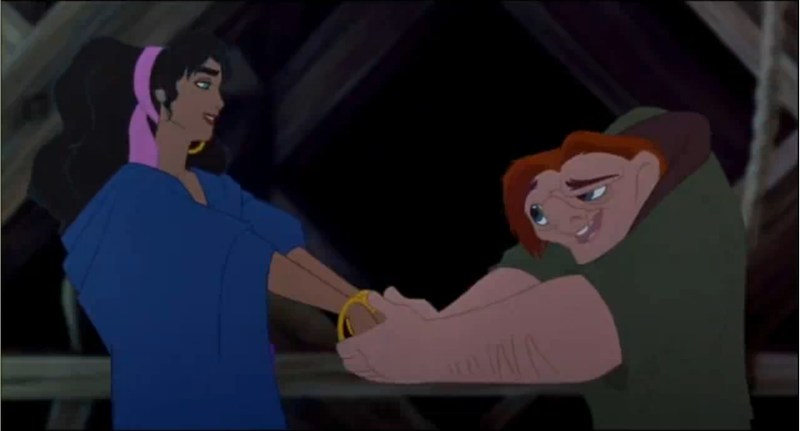 Did Quasimodo have to marry them? Because he did that but it was cut from the movie. He did join their hands and looks happy for them. 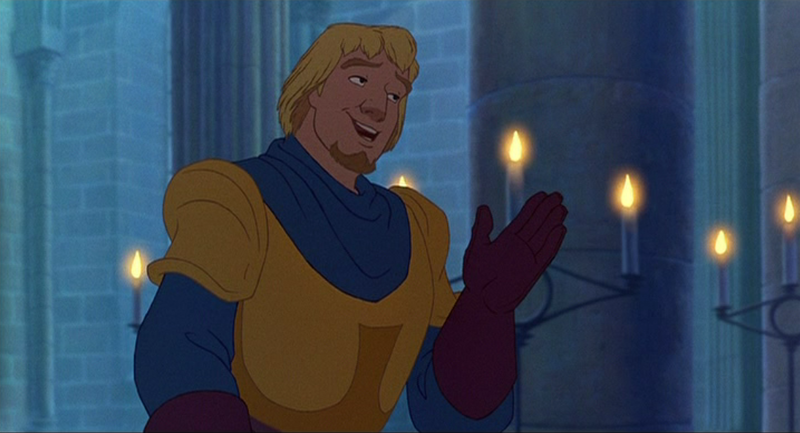 I don’t want to say this movie is subtle but when it comes to getting that Esmeralda and Phoebus are perfect for each other, people either are in denial or really do just perceive Esmeralda as shallow when she doesn’t actually do anything really shallow except fall in love with a guy that is like herself. But perhaps the main reason for people’s general denial of acceptance of this couple is because many people can relate to the protagonist and in him getting the girl it gives us the viewers hope that we too can reach our goals. 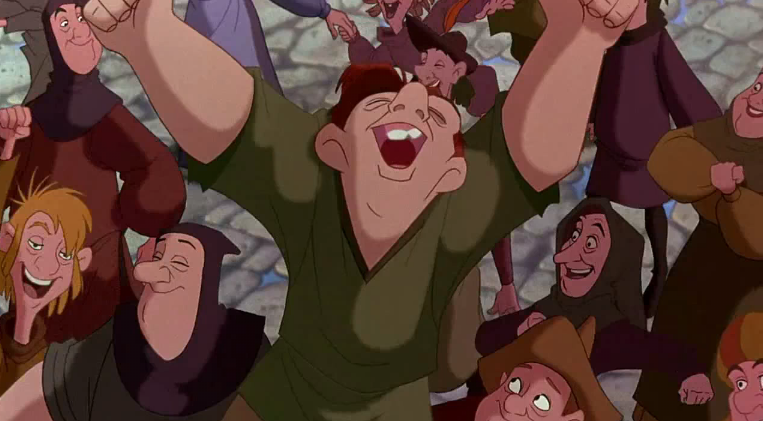 However I will point that Quasimodo’s main goal was to be accepted by society which he was in the end. His mission from the start was to spend a day outside without fear not to fall in love. 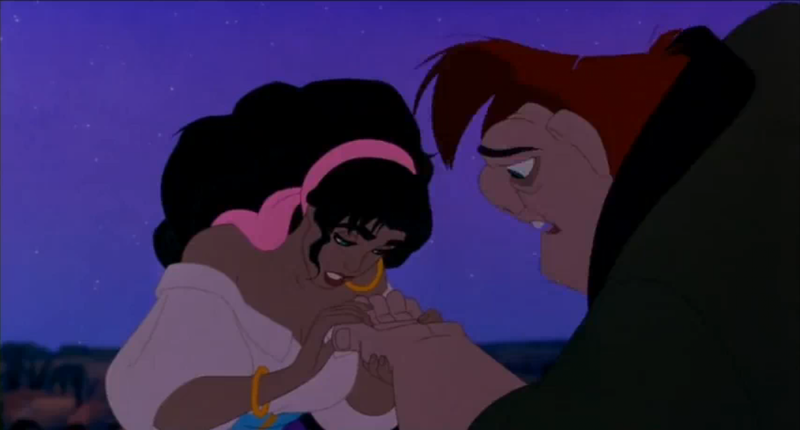 One could make the point that his goal changed when he met Esmeralda but it really just seemed that his attachment got twisted into love by the gargoyles and an overall love of love. He was never really in love with Esmeralda he was in love with a perception of her based on that it was his time talking to a female and she was nice to him. His affection for her was not a deep love it was a strong friendship. I’m sorry to rant like this but it just so annoying that people complain about this so much.